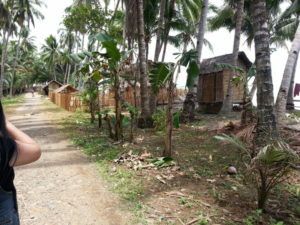 The children’s home is located in a small fishing village between the towns of Sindangan and Leon B. Postigo on the north coast of the island of Mindanao. 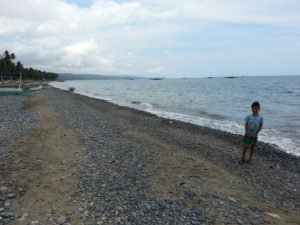 To get to it, you take a gravel road from the national highway and head to the ocean. It tee’s into a road or kind of graveled road that parallels the coast. Main road going to the village from the highway. 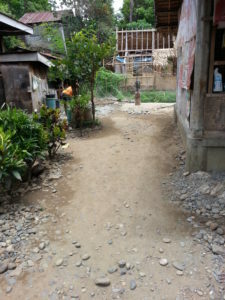 The community is a mostly a fishing village with a limited amount of farming done up the hillsides. 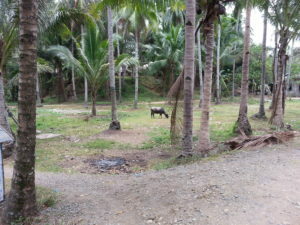 Besides the dried fish, there are a few small rice fields and groves of coconut trees. 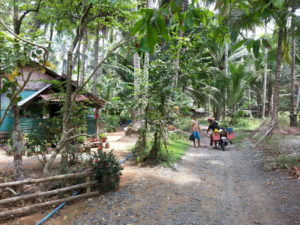 The village has houses mostly built out of palm, bamboo, and other locally found materials. There are 5 or 6 houses made out of concrete blocks. These are mostly people that have children working overseas that have sent money to have these houses built. The sad thing is that people have borrowed money against 3 of these homes and couldn’t pay the bank back so the bank has foreclosed, or whatever term is used there. 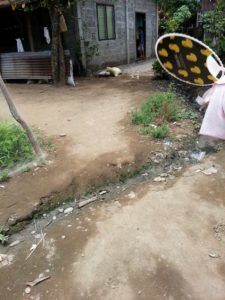 The open ditch for water runoff and unfortunatly some sewage. 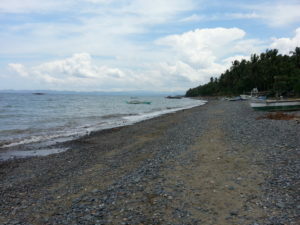 Along the rocky shore, are small houses and covered shelters where the people live and work. While I was walking along the shore with the children, we passed several covered shelters where the men were working on equipment for the fishing. As I understand it, they do a lot of the fishing at night using a light to draw the fish, and then during the day, dip the fish in a brine and then lay them out to dry. 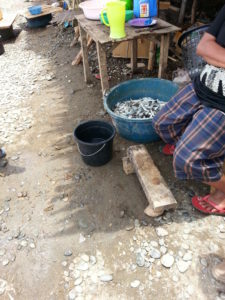 One of the women that I talked to would work 6 hours during the night wading in the ocean catching fish and then go home and rest only to return in the morning to work another 6 hours dipping and putting fish out to dry. For this, she would get paid $1.35 USD. In foam boxes to send to market in other towns. Her story is so very common in the village. One of the men is a general laborer and when he can get work, is paid about $2.00 USD a day. He averages about 15 days of work a month. 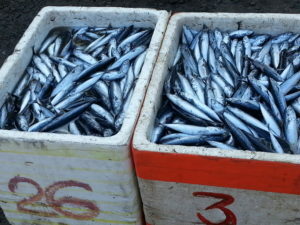 The fishing is not steady work because when the water is very rough they are not able to take the boats out and it is usually too rough to wade out far enough to catch many fish. But this is home to them and where the children’s home is located. This is also why we have such a need to help for the vey basics of life for them.